China’s rise is altering global power relations, reshaping economic debates, and commanding tremendous public attention. Despite extensive media and academic scrutiny, the conventional wisdom about China’s economy is often wrong. Cracking the China Conundrum provides a holistic and contrarian view of China's major economic, political, and foreign policy issues. Yukon Huang trenchantly addresses widely accepted yet misguided views in the analysis of China’s economy. He examines arguments about the causes and effects of China’s possible debt and property market bubbles, trade and investment relations with the Western world, the links between corruption and political liberalization in a growing economy and Beijing’s more assertive foreign policies. Huang explains that such misconceptions arise in part because China’s economic system is unprecedented in many ways—namely because it’s driven by both the market and state—which complicates the task of designing accurate and adaptable analysis and research. Further, China’s size, regional diversity, and uniquely decentralized administrative system poses difficulties for making generalizations and comparisons from micro to macro levels when trying to interpret China’s economic state accurately. This book not only interprets the ideologies that experts continue building misguided theories upon, but also examines the contributing factors to this puzzle. 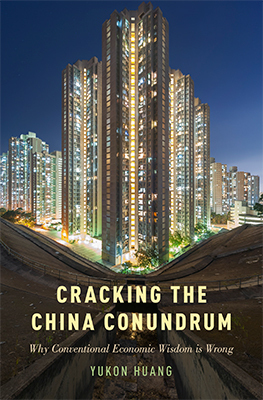 Cracking the China Conundrum provides an enlightening and corrective viewpoint on several major economic and political foreign policy concerns currently shaping China’s economic environment.